My favourite types of activities are those that can turn the “hmmm” into an “ah ha!” without too much involvement from me. This type of activity really encourages mild confusion (The Gift of Mild Confusion) and was really rewarding for my students when they eventually worked it out! Dissolving and solubility is all about intermolecular forces. Iodine is simple molecular and non-polar, it can only form London Dispersion forces between its molecules. Using the “like dissolves in like” rule for solubility, this means that as iodine is non-polar, it’s much more soluble in a non-polar solvent like hexane, than a polar solvent like water. Potassium permanganate is ionic. Ionic substances are the most polar substances you can get, so they are much more soluble in a polar solvent like water. Once you’ve worked out that the iodine is dissolved in the organic (hexane) layer and the potassium permanganate is dissolved in the aqueous (water) layer, the final step is to work out whether the water or the hexane is more dense i.e. which one is on the top, which one is on the bottom. By doing a separate experiment adding water to hexane we showed that the water layer is on the bottom, making the left hand one the iodine, the right hand one the potassium permanganate. The kids were also mesmerised when I added some new potassium permanganate to a fresh mixture of hexane and water – just watching it cruise through the hexane before it dissolved in the water is awesome! 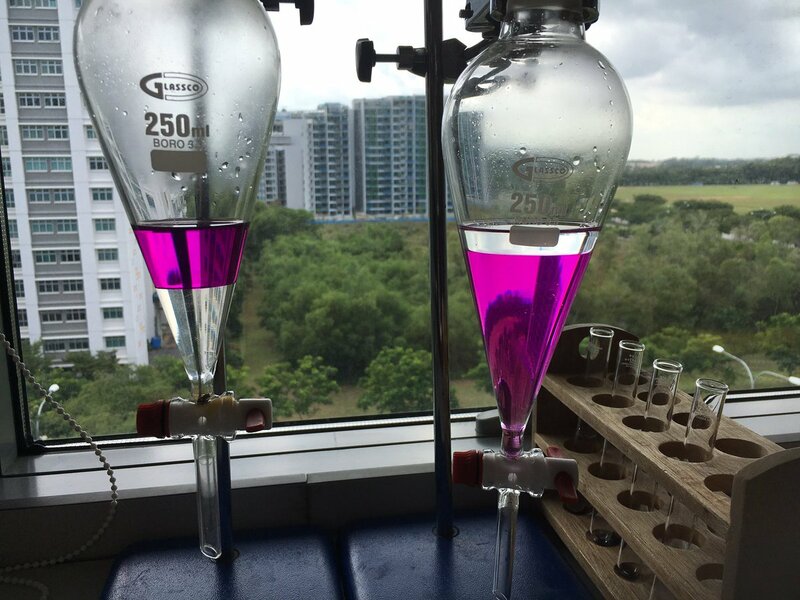 If you really wanted to go crazy on proving which was Iodine and which was the Potassium Permanganate then the redox titration with oxalic acid suggested by @ChristOfJaegar and @haveri_speaks is definitely the easiest (and safest!) way to do it!